Most concept clocks are high on art, and low on functionality. That’s not the case with the Aspiral Clock, designed by Will Aspinall and Neil Lambath. Instead of using the standard hands, this clock uses a small ball to tell the time. As time progresses, the entire clock spins, which causes the ball to move along the spiral. 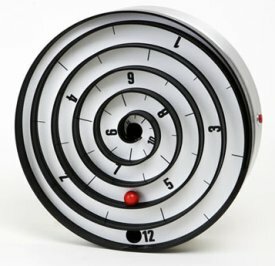 The numbers on the face of the clock is labeled with your standard numbers, and as the spiral turns, the ball moves and indicates the proper time. Interesting concept, no? Best part, these are actually available for sale online and in assorted colors. Now, they aren’t cheap – you’re looking at $526 (plus shipping) to get one of these from the UK.